As anyone who has read this blog regularly may have guessed...I am going to table it for the moment as I turn my focus to other writing projects in the New Year. I've had a great run over the past 30 or so months writing about sailing culture and - save for the very end - maintained a firm posting discipline that generated interest and attracted sailing readers from all corners of the globe. It's been my pleasure to be part of your world in this way. Good luck and best wishes for 2008! Recently came across the below tribute...I never knew Mitch but of course, like many life-long sailors from the Northeast U.S. (and beyond) certainly knew of him. This was penned by his brother Peter, the father of an old friend of mine. Mitch passed on February of this year. We are the poorer for it. My brother, Mitch wouldn’t want me writing about the quick onset of his cancer or how soon after the diagnosis he left his family, friends and colleagues. But, on February 4, 2007 Mitch finished his race and we are all short a phenomenal member of the crew. Sailing was in Mitch’s blood. Both parents were avid sailors, so it was appropriate for him to be in a dinghy cockpit at a very tender age. Mitch had a Sneakbox, named Odd Socks, in his youth. One afternoon, he let me take her out on Barnegat Bay. I landed her downwind and smashed the bow. Not only did he not tell our folks (‘tho he did holler at me for a moment), he didn’t begrudge my tactical error. That is an attribute Mitch displayed again and again throughout his life. His character was strengthened by the will to “move on”. Perhaps that’s what got him through swift boat duty off Viet Nam, Harvard Business School, and then the hard sell of yacht design and brokerage for over 30 years at Sparkman & Stephens under the tutelage of Rod and Olin Stephens. Mitch loved just about every type of boat. Sailing with Mom and Dad (Sunny & Flossie) on the family boat Prim was an important part of Mitch’s life. He was Dad’s right hand man on Souther, Blue Star, and Serenade, as well. Mitch taught his sons T.M. and Paul the characteristics of a proper yacht by the time they were in elementary school. He was a member of the Cruising Club of America, New York Yacht Club, and Noroton Yacht Club. Although Mitch’s offshore miles are too extensive to count, he logged enough to complete 20 Bermuda Races and two trans-Atlantic races. His first Bermuda Race was on Prim in 1958, and the last was on a NY32, Siren, in 2006. His membership with CCA began in 1966 and as a member he set a fine example of excellent yachtsmanship and good seamanship. Mitch was a corporate member with Sea Education Association. This year a trophy was donated in his name in the Eggemoggin Reach Regatta for NY32 class by his friend, Bob Scott. If you knew Mitch, you knew he cared about you and cared about what was important to you. If you knew Mitch, you also knew all phone calls never lasted more than two minutes! 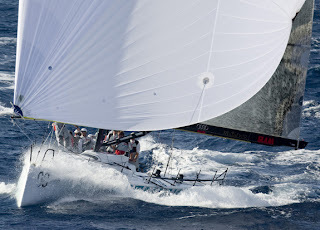 Who can blame a fellow who’s set to meet a client in Europe on Saturday, help his father fix a boat in Maryland on Sunday, attend an S&S meeting in Manhattan on Monday and make Key West Race Week on Tuesday? The man loved his boats and got a kick out of all the people who went with them. From The Helium Report: Zephyr (sail) is the personal blog of a regular joe who used to crew racing yachts. This New England sailor writes about “sailing culture” and uses poems, song lyrics and pictures of his 5-year-old son’s first overnight sailing trip to remind his readers of the magic of boating. 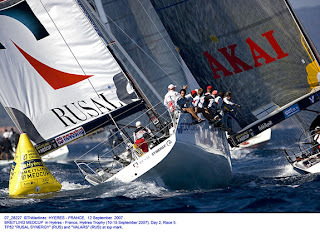 The site also provides news of the sailing world, great shots from major regattas and the blogger’s two cents on media coverage of sailing topics. As the winter season comes on it's time to think of alternatives to sitting by the fire thumbing old copies of SAIL Magazine (or surfing the many enlightening sailing blogs). There is always the West Indies...at least if you live in the Northeast U.S. Florida. The South Pacific. San Diego. There are die hards who tout frostbiting. And...as the UK Telegraph points out...there is always ice sailing. Do: Wear a helmet. Don't: Sail over thin ice. Here's a website for European oriented crazies...errrr I mean ice sailors. But I'm quite certain that the good ol U.S. has its fair share of nut cases...or ice sailing enthusiasts. And I'm willing to bet they gather on lakes throughout the midwest. Seriously...I have the balls to take a 77' yacht offshore (though it's been awhile) but could I tackle screaming across the ice on a modified sailboat? It takes a special person. I know that there are a few die-hard "frostbiters" out there but most of us along the Northeastern U.S. seaboard have turned to our fireplaces and armchair sea tales about now... soon it will be time for turkey and pumpkin pie. Other, more fortunate voyagers, have turned their bows south for warmer climes. Once upon a time I participated in this migration and still feel the pull of sparkling blue turquoise water and steady Christmas winds on the beam. But we take what we can get...which is why it was my pleasure to join my father and brother last weekend as we accompanied my five year old son on his first sailboat overnight. Admittedly not a lot of sailing was accomplished. Even on the Chesapeake the chill winds can blow in November. But we found a nice, albeit unpopulated, anchorage off the Tred Avon River and proceeded to indoctrinate the boy into life aboard. We were lucky on two counts...one my Father has DVD capability which, after we'd explored the 46's Morris sloop stem to stern, was a blessing. The other was that the boy sleeps soundly which, after we'd run through the available single malt scotch, was as well a blessing. It's been a busy month what with the trip to Spain and work-related projects coming on big time. Not as much opportunity for sailing or writing but don't give up...Zephyr Sail will see 2007 through in good form. Heading to the Chesapeake...where warm weather lingers...for a Fall sailing weekend on November 10. My Dad and I are going to take my five-year old son on his first overnight sail. A brief sojourn up the Tred Avon to drop the hook up some deserted creek. Nothing fancy but I always welcome the opportunity to be on the water with these two people and the fall season on the Chesapeake can be breathtaking. I took a look through my archives, which stretch back a few years now, and noted that October has always been a big month for coverage of the Annapolis Sailboat Show. I missed it this year but be certain to read Herb's blog post over on Cruising World - he details the annual changing of the guard that marks the division between the Powerboat and Sailboat shows along the Annapolis waterfront...a drunkenly, gleefully observed occasion I'd completely forgotten about until now...appropriately known as Breakdown Day! We realized during our trip to Spain just how myopic and "blanketed" the generic U.S. media are - reflecting, no doubt, their readers preferences for American-centric claptrap such as the fiasco of OJ Simpson and whether or not Hillary C can best that guy from Law & Order. Sure, you can read about what's happening in the rest of the world but you'll have to really want to. Sailing demands, in many ways, a more international perspective...particularly as it applies to the racing circuit. That being said - the U.S. Sailing media does cater to the U.S. audience in much the same way. 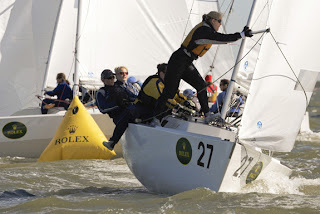 Point being that at any given moment exciting, eventful and well attended sailing occasions are happening all over the world...occasions that most sailors in the U.S. are only dimly aware of. Take the glamorous Voiles de Saint-Tropez. A total of 3,500 sailors, 304 modern and classic yachts took part in last week's 9th edition of the Voiles de Saint-Tropez. U.S. based veterans of the Rockville Regatta and Block Island Race Week and Key West and...going pretty far afield here...Antigua Race Week. Ever heard of the Voiles de Saint-Tropez? If the answer is "yes" then congrats...you're in a minority! Our trip to Spain - while not as sailing oriented as Tillerman's - was significant in so much as it was the first time we'd been away alone together without the two children (2 and 5 years) for a long, long time. Though we were only in Spain for five days...we very much enjoyed a brief stop in Barcelona and an extended weekend on the island of Mallorca for a friends wedding. I made a note to return for a Moorings bareboat charter out of Palma when time and finances permit...the Balearic Islands seem very much an ideal Mediterranean cruising destination. Back to writing about sailing next week! And fly away to somewhere new..."
In a modern day twist on the "Prince and the Pauper" the Marin Independent Journal ran a story recently on..."the gold collar-blue collar partnership of Larry Ellison and Norbert Bajurin - the billionaire and the mechanic..."
Says the journalist...." At first glance, the two men seem to have little in common." Um, well yes. How many of us truly have something in common with the fourth-richest person in 2007, a man who Forbes reports as having a net worth of $26 billion? Well there is the "common" interest in sailing...only with Larry its not so common. Reminds me of my Ellison sighting story. 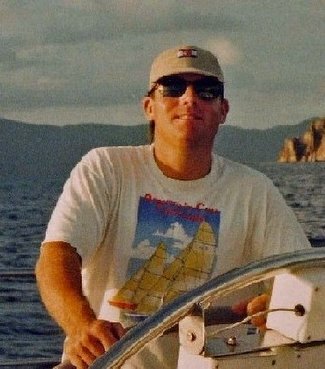 I was crewing for John Sweeney in a vintage America's Cup regatta on the SF Bay circa 2003. I had the mast position on US-11 Stars & Stripes. At first I was taken with the glamor of it all but I have to say, honestly, that vintage AC boats not only require a lot of $$ to keep up but they also begin to make scary noises in wind above 15 knots. Luckily during my brief tenure only one block blew up with no lasting harm done. Anywhoo...we were reliving the race at the yacht club bar in Sausalito. I was on the deck overlooking the harbor and glanced over to the bar to see if the time was right for another drink run...people three deep stood chattering around a skinny man obscured save for his pale, hairless legs shod in old school topsiders, black dress socks pulled to mid-calf. He may have been out of sight but his voice wasn't. We could clearly hear him bellowing at his entourage, all of them to a one wagging their heads in unison. "Who in the hell is that?" I asked, guessing at some local dignitary or sailing legend gone to seed. "Ah c'mon dude," my new found mate sneered in disgust at my lack of savvy. "That's Larry." We all know that marinas are where the action is...the flotsam and jetsam of the boating life mingling with shore side nonsense - and if folks want to call them "floating trailer parks" well that's just fine. A good marina is an appropriate mix of seamy, comforting, exclusive (even if it's not gated), gossipy and glamorous. Some lean heavier on certain aspect of the mix than others but they all are, for the most part, interesting places. And unlike a trailer park, all one has to do is cast off the dock lines to be free of one. Much more appealing. There's a terrific story in the New York Times today about a Washington DC marina that is, as you might imagine, a political place chock a block with political people and their (well paid) flunkies. It's a good reminder that even in a less than ordinary place like the nations capital, a marina is just a marina after all...with all the accompanying features any experienced marina-dweller would certainly recognize.